Deep in the reinforced concrete bunker that served as a tactical operations center, Capt. Frank C. Willoughby, a young Green Beret detachment commander, studied the acetate-covered operations map on the wall before him while he held a telephone to his ear. Power generators and radio static buzzed in the background. In the dim light his wristwatch glowed 1932. He knew that it was now dark in the camp above him, but here in the bunker it was always night. He put down the telephone; two of his defensive positions had just reported hearing noises that sounded like engines idling, and he was now convinced that an enemy attack was not far off. It was 6 February 1968, only a few days since the Free World forces had felt the fury of the unexpected Tet (lunar new year) offensive the entire length of South Vietnam. All the signs of another enemy attack were there. In the middle of the morning a mortar barrage had slammed into his camp without warning, wounding eight Vietnamese soldiers. In the early evening, fifty rounds of enemy 152-mm. artillery fire from across the Laotian border had wounded two more soldiers and heavily damaged two bunkers. Since then he had received frequent reports of strange noises and trip flare booby traps going off. As a precaution, Willoughby radioed an alert to the Khe Sanh Marine Base, a few kilometers away to the northeast. Whatever the enemy planned, he expected that the big guns at Khe Sanh would make it costly. armed North Vietnamese infantrymen followed in the dust and exhaust raised by the tanks. As the first two tanks, their commanders perched in the cupolas, reached the barbed-wire barrier that outlined the camp, a trip flare ignited, bathing the green metal tanks and dust-covered soldiers in an eerie flickering light. For a second both the camp's defenders and the enemy force were transfixed, staring at each other, then both sides began firing furiously. The battle for Lang Vei had begun. Under the control of the 5th Special Forces Group, the Lang Vei Camp had been conceived as a base from which to administer the local Civilian Irregular Defense Group (CIDG) program to train and equip locally recruited Vietnamese. These irregulars would operate in the remote, sparsely populated, contested areas where they could be more effectively used than Vietnamese Army and other Free World forces. By late 1967, working jointly with Vietnamese Special Forces teams, twelve-man American Special Forces A detachments were operating sixty-four CIDG camps throughout Vietnam, from Lang Vei in the north to Phu Quoc Island, some sixty kilometers off the southern coast in the Gulf of Siam. and three combat reconnaissance platoons. These units ranged the entire tactical area, from time to time engaging in minor skirmishes with the enemy. Detachment A-101 had originally been established in July 1962 at Khe Sanh. The camp had remained operational until December 1966, when it was moved west to a site near the village of Lang Vei so that marines could occupy Khe Sanh as part of an American troop build-up in the northern provinces. The first camp established at Lang Vei proved to be temporary. A ground force of North Vietnamese regulars, aided by a well-organized group that infiltrated the CIDG troops within the camp itself, penetrated the camp on 4 May 1967. Both the detachment commander and his executive officer were killed. Although the enemy failed to seize the post, damage was extensive. Because major reconstruction would have been required and since the site itself, as the attack revealed, lacked good observation and fields of fire beyond the barbed-wire perimeter, the commander of the Special Forces Group decided to relocate the base at a more suitable place about 1,000 meters to the west. The new camp on Highway 9 near Lang Vei was completed in late September 1967. While Captain Willoughby's men worked to strengthen the new camp's defenses throughout the fall, his patrols made relatively few contacts with the enemy. In December 1967, however, reliable sources reported large enemy concentrations in Laos, only a few kilometers away, and patrols based on Lang Vei made more frequent contacts with the enemy. By mid-January intelligence agents warned that enemy battalions were infiltrating across the Xe Pone River, their destination Khe Sanh. At the same time, artillery and mortar fire began to harass the Lang Vei Camp at least two or three times a week and small enemy patrols sometimes probed the perimeter. On 21 January 1968, after a brief fight, the village of Khe Sanh fell into North Vietnamese hands, and the next day scores of civilian refugees began to descend on the CIDG camp and the nearby village of Lang Veil A few days later, on the 24th, survivors of the 33d Royal Laotian Battalion and their dependents, 2,700 in all, streamed into Willoughby's camp from the west, with tales that an enemy tank-infantry force had overrun their camp. materials and tools to refortify the old Lang Vei Camp, where they would remain until he received further instructions from Da Nang. While the adviser team inoculated the Laotians against cholera, Willoughby's men distributed rice, powdered milk, and other essential food supplies, a task that was to continue indefinitely. The new refugees crowded into Lang Vei Village and the small settlements around it. Since the Laotians' base camp was only fifteen kilometers away on Highway 9 in Laos, the news of the tank attack caused Willoughby some concern. It shed light on an earlier report from a forward air controller who had sighted five enemy tanks moving away from the scene of the battle and had called in an air strike which destroyed one. Although Willoughby assumed that the Marine combat base at Khe Sanh was the enemy's primary objective, he realized that any sensible enemy force would have to do something about his camp. His fears were confirmed when a North Vietnamese deserter turned up at Lang Vei on 30 January and revealed after questioning that he had been a member of a reconnaissance team from a North Vietnamese battalion bivouacked just across the river in Laos. The team had reconnoitered Lang Vei's defenses the night of the 28th, he said, specifically to pinpoint heavy and automatic weapons positions. An attack had been planned and canceled twice for reasons unknown to the Vietnamese captive. There were tracked vehicles positioned near his battalion. Willoughby had done what he could to safeguard his small post by stepping up his nightly ambushes and daylight patrols. His resources were meager, however, for he had been able to recruit only 65 percent of the strength authorized for his three companies and three platoons. Earlier in January Company C had reinforced him with a 161-man mobile strike force company of Hre tribesmen along with six Green Beret advisers. By the middle of the month Willoughby had disposed a platoon of this crack outfit at an early warning outpost, 800 meters west of the camp, in fortified bunkers with overhead cover, surrounded by barbed wire and claymore mines. The Hre Montagnards patrolled during the day and occupied ambush positions in the vicinity of the camp at night. The other two of the company's three platoons operated from Lang Vei Camp itself. ous Lang Vei Camp, the base would be defended by one-third of its strength while the other two-thirds operated in the tactical area of responsibility. 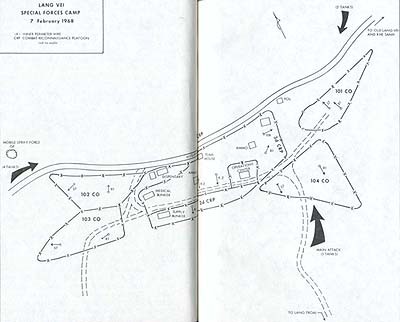 Although in late January some individual positions and bunkers were still being constructed, or repaired because of the damage inflicted by enemy artillery and mortar fire, the entire camp was ringed by a strong three-layer barbed-wire barrier fifty meters wide, laced with claymore mines emplaced at maximum effective small arms range. All completed bunkers and individual positions were heavily sandbagged on all sides and overhead. All fighting positions had excellent fields of fire, so situated that enemy troops would find it costly to attack up the hillside. Within the defenses, Willoughby had placed his companies and platoons in mutually supporting positions, each with American advisers from the detachment. Each company and platoon position within the perimeter was further enclosed with barbed wire and ringed by claymore mines and trip flares. On the northeastern flank he placed his Company 101 of eighty-two Bru tribesmen. South of it he placed his Company 104, whose strength was, as in other units, actually little more than that of a reinforced rifle platoon. At the opposite end of the compound, 450 meters to the west, he located his Company 102, forty-two men, while just to the south and contiguous to the position he placed the forty-three men of Company 103. Since Willoughby considered Company 101 his weakest unit because of its leadership, he put his 3d Combat Reconnaissance Platoon behind it as a backup force, placing the 1st and 2d Reconnaissance Platoons on the northern and southern perimeter, respectively, 200 meters apart. In terms of firepower, Willoughby was well prepared. For heavy indirect fire support for the entire base, he had two 4.2-inch mortars with over 800 high-explosive and illumination rounds. Each company and platoon area had one 81-mm. 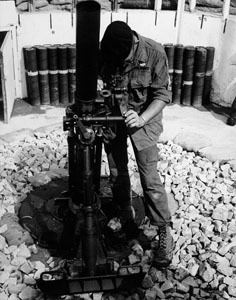 mortar for which 2,000 assorted rounds of ammunition were available. Nineteen 60-mm. mortars were positioned strategically throughout the camp, with nearly 3,000 high-explosive rounds on hand. Detachment A-101 had an impressive number of crew-served automatic weapons. For general support of the post, one .50-caliber machine gun was set on top of the detachment's living quarters, the "team house," just behind the 1st Reconnaissance Platoon, where it covered the northern approaches to the camp. In the 2d Reconnaissance Platoon area another .50-caliber machine gun covered the southern approaches and could reinforce the 106-mm. recoilless rifle fire in that direction, especially along the Lang Troai Village road. For the two machine guns there were over 17,000 rounds available. The CIDG companies and platoons were armed with forty-seven .30-caliber machine guns and more than 275,000 rounds of ball ammunition; thirty-nine Browning automatic rifles (BAR'S) with close to 200,000 rounds; and two M60 machine guns with 5,000 rounds. Individually, CIDG troops carried M1 and M2 carbines for which almost 250,000 rounds were on hand-enough for three basic loads per man, with a resupply stockpiled at company level. Also available were almost 1,000 fragmentation grenades, 390 claymore mines, and 250 12-gauge shotgun rounds for the few shotguns on hand. For artillery support, Willoughby could call on sixteen 175-mm. guns, sixteen 155-mm. guns, and eighteen 105-mm. 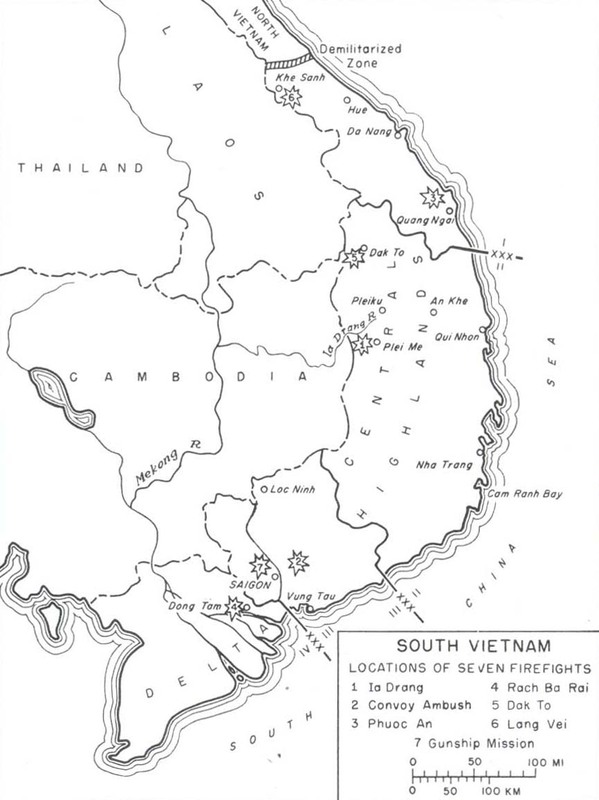 howitzers from Khe Sanh and other locations within range. Well before the end of January, a variety of concentrations had been registered in, with particular emphasis on likely avenues of approach and suspected enemy staging areas. Ready for close-in support, if needed, were Marine all-weather (radar-controlled) fighter aircraft. U.S. Air Force planes might be called on as well, among them the deadly Spooky with its illuminating flares and rapid-fire miniguns. If necessary Willoughby could request at least two rifle companies from the 26th Marine Regiment, based at Khe Sanh. Provided that the tactical situation at Khe Sanh allowed it, these companies were prepared to move on short notice by foot or helicopter to previously selected landing zones as part of an already rehearsed reaction plan. Also, Da Nang Company C, 5th Special Forces headquarters stood ready to send in another mobile strike force company if the need arose. when the enemy's Tet offensive struck it during the early morning hours of 7 February 1968. The five-tank contingent that advanced on Willoughby's fortress formed the main effort of a sizable attacking force. Supported by at least four 152-mm. artillery pieces and four 82-mm. mortars, two other columns were also advancing on the camp: four tanks and two North Vietnamese infantry platoons surged toward Companies 102 and 103, while two tanks advanced on Company 101 from the north. Perhaps the first American to see the enemy was Willoughby's 24-year-old assistant medical specialist, Sgt. Nickolas Fragos. Manning an observation post in a tower above the tactical operations center when the tanks first approached the wire along the Lang Troai road, Fragos could hardly believe his eyes. In the flickering flare light he saw two North Vietnamese soldiers kneeling calmly in front of the lead tank, attempting to breach the barbed-wire barrier in front of Company 104. "Why don't they let the tank treads crush the wire?" wondered Fragos dazedly. Before his eyes the two enemy soldiers slumped over dead, cut down by the Company 104 defenders. Fragas radioed Willoughby. "We have tanks in our wire!" That done, he rushed down into the operations center and described what he had seen to Captain Willoughby. Lt. Col. Daniel F. Schungel, the Company C commander from Da Nang, listened incredulously. He was in the camp by chance, having arrived early in the afternoon of the previous day on a visit that was primarily a gesture of diplomacy toward the Laotian battalion commander, who was also a lieutenant colonel. Colonel Schungel, accompanied by Willoughby and the Vietnamese operations officer of the camp, had inspected the defenses the preceding day and believed at the time that the camp was well prepared. Now he raced up the concrete steps to see the tanks for himself. Willoughby and Fragos followed. They stared in amazement at an enemy tank, its main gun blasting away at Company 104 bunkers, then rushed back down into the operations center. Schungel told Willoughby to concentrate all available artillery and air support on the massed force just in front of Company 104. He also told him to request a flagship and to ask for everything through parallel channels, the marines at Khe Sanh and Company C. Colonel Schungel then hurried back upstairs to join the fight and to organize "tank-killer" teams. explosive cannon rounds. Behind them the North Vietnamese infantrymen crept slowly, deploying and firing their AK47 automatic rifles into positions marked for them by tracer machine gun fire and searchlight beams from the tanks. Willoughby's men returned fire furiously. Moments after the attack began, Sfc. James W. Holt, the team's senior medic, was at his duty post in the 2d Reconnaissance Platoon area. He trained the 106-mm. recoilless rifle on the lead tanks and in the glare of an 81-mm. illuminating round scored direct hits on both of them at less than 350 meters. As the tanks began to burn, enemy crewmen, including three women armed with M16 rifles, climbed from escape hatches and raced for cover. Reloading, Holt blasted away at the enemy with three "Beehive" rounds, and Colonel Schungel and CIDG riflemen helped to pick the enemy off with hand grenades, LAW's, and rifles. Still other enemy troops pressed forward. A third tank appeared, swung around the two flaming hulks, and, its coaxial tracer rounds beating a deadly pattern, crashed through the barbed wire and into the Company 104 sector. A few meters behind Sergeant Holt, S. Sgt. Peter Tirach, the detachment intelligence sergeant, was at one of the 4.2-inch mortar pits. Tirach and two junior radio operators, Spec. 4 Franklin H. Dooms and S. Sgt. Dennis L. Thompson, and Sfc. Earl F. Burke, a platoon leader with the mobile strike force company, had been firing illumination and high-explosive rounds, the latter as close as possible behind the enemy tanks, in the hope of stopping the accompanying infantry. Seeing that Holt was alone at the 106 and figuring that there were more than enough men to do the job at the mortar position, Sergeant Tirach scrambled to Holt's side and helped him load another round into the weapon. It was the last high-explosive round at the position. Traversing slowly, Holt aimed at the third tank and fired, scoring a direct hit and immobilizing it, but not before the tank had destroyed at least three bunkers in the Company 104 area. Since there was no more high-explosive ammunition, Tirach returned to the 4.2-inch mortar pit while Holt ran toward the team house a hundred meters to the north. Holt was never seen alive again. No sooner had both sergeants left than another enemy PT76 churned up the Lang Troai road at top speed and into the breach in the wire. Grinding to a halt, the tank fired point-blank at the 106-mm. recoilless rifle, destroying it. Soon joined by another tank, the PT76 rumbled forward into the Company 104 area. attack and U.S.Marine headquarters there wanted more information as to the size of the enemy force attacking Lang Vei, there was a delay. The fight was fifteen minutes old before the first artillery rounds smashed just outside the camp perimeter. With various team members above him observing and adjusting the bright quick flashes, Willoughby relayed target corrections to the marines, who fired volley after volley of high-explosive and illumination rounds in response. Since Willoughby considered the enemy thrust against Company 104 to be the enemy's main effort, he concentrated the artillery firepower there in the early stage of the battle. By 0100, ten minutes after the artillery had begun firing, a U.S. Air Force forward air controller arrived, along with a flareship and a Spooky gunship. Circling the camp, the controller radioed to Willoughby that fighter aircraft were on the way. They arrived moments later. At Willoughby's request, the controller directed air strikes along the ravine north of the camp, on the Lang Troai road just south of it, and to the west of the mobile strike force early warning outpost. Despite the air strikes, continuing artillery support, and courageous efforts by the men on the ground, the situation steadily worsened for Lang Vei's defenders. Enemy soldiers succeeded in exploiting the tank penetration into the Company 104 area, forcing its defenders to pull back into the 2d and 3d Platoon position behind them, which in turn exposed the southern flank of Company 101. Seizing this advantage, the North Vietnamese troops poured a murderous fire into Company 101 from their newly captured Company 104 positions. Two more tanks soon added to the fire and an infantry company attacked Company 101 from the north. Automatic weapons flashed and mortar shells threw up geysers of earth. Just as the attacking troops reached the barbed-wire perimeter, Willoughby called for the nearest artillery concentration. The first volley landed in the center of the camp, but he adjusted it quickly so that the fire fell into the enemy's ranks, stopping the assault for the moment. The enemy fire from the Company 104 area, along with the shock effect of the two tanks, proved, however, too much for the CIDG defenders, who retreated to the 3d Platoon positions behind them. Thus by 0115 the entire eastern end of the camp was in enemy hands. crackle of several automatic weapons sounded everywhere. Although the CIDG defenders fought courageously, they were no match for the determined enemy with his armored support. 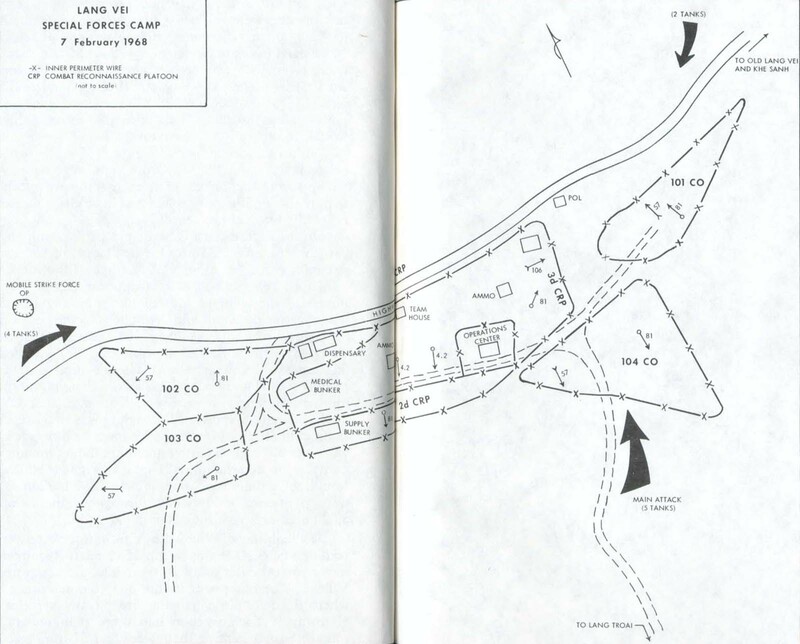 In short order both companies were overrun, exposing the western end of the camp. Survivors, still fighting, withdrew, some heading toward the reconnaissance platoon positions while others moved toward Highway 9, hoping to make it to Khe Sanh, to the east. Nor was the situation any better at the mobile strike force observation post, 800 meters west of the camp. Sfc. Charles W. Lindewald, an adviser with the platoon-size force, had radioed Willoughby that he was being attacked by at least a company and possibly two tanks just as the enemy force had smashed into Company 104. Believing the outpost in danger of encirclement, Lindewald called for artillery fire. A few moments later a machine gun bullet hit him in the stomach. While Sfc. Kenneth Hanna, Willoughby's heavy weapons sergeant, administered first aid, Lindewald directed artillery fire on the enemy force that was snaking toward his position. Lindewald died as North Vietnamese soldiers seized the hill. Hanna was captured by the soldiers and never seen again. Inside the Lang Vei Camp, Colonel Schungel's hastily organized tank-killer teams were ready by the time Holt had destroyed his second tank. After leaving the operations center, Schungel had collected 1st Lt. Paul R. Longgrear, who commanded the mobile strike company and had been busy at the Number 2 81-mm. mortar pit; First Lieutenant Quy, the Vietnamese operations officer; and 1st Lt. Miles R. Wilkins, Willoughby's executive officer, who had been at the second 4.2-inch mortar position in the 2d Combat Reconnaissance Platoon sector. A junior radio operator, Spec. 5 William G. McMurray, and Sergeant Fragos, along with a few Civilian Irregular troops, joined the group. Arming themselves with LAW's, they fanned out as two-man teams in search of targets. Schungel had even snatched up a few LAW's and fired-at the first two tanks before Halt had, but with little effect. Under the intermittent glare of green tracer bullets fired from an enemy 12.7mm. machine gun somewhere to the north, Schungel and Fragos lay prone near the operations center, firing until their small supply of LAW's was exhausted, but without apparent effect on the enemy tanks. Schungel, concerned about the two tanks that now roamed the Company 104 area at will, yelled to Fragos to get more LAW's. the weapons to his shoulder, squinted through the sight, and fired at the nearest of two tanks, perhaps seventy-five meters away. With a dull metallic click the weapon misfired. Casting the dud aside, Fragos snatched the other LAW and fired. With a muffled explosion, the projectile buried itself in the earth ahead of the tank's front tracks. Too short! Fragos scurried back to Colonel Schungel's position just as a burst of machine gun tracers blasted the spot where he had been. Fragos found Schungel trying to remove the safety from a LAW. He tried it himself but to no avail. While other tank-killer teams fired at least five missiles at the still-advancing tanks but failed to stop them, Fragos rushed down into the operations center in search of a sharp instrument to use on the jammed safety. Inside the center, Fragos picked his way among the wounded- six Americans and a number of South Vietnamese who lay sprawled about on the floor. Across the crowded room, he called to Willoughby, who was occupied at his radio, that green tracers from heavy machine guns were coming from the north. Sizing up the probable machine gun position from what Fragos told him, Willoughby immediately radioed the marines' supporting artillery for a variable time mission from all available guns just north of the Company 104 area, outside the wire. In seconds he received an "on the way" from the marines. Unable to locate a suitable tool with which to remove his LAW's safety clip, Fragos left the weapon in the operations center and rejoined the battle above. He was just in time to see Colonel Schungel, on one knee, calmly taking aim and then firing a missile at the still-advancing lead tank. In a shower of bright orange sparks, the rocket smashed broadside against the tank. Yet the tank, apparently undamaged, continued to dash about amidst the bunkers of Company 104.
one could get close enough to the tank to immobilize it with a well-placed charge. Specialist Moreland and Sergeant Fragos ran for the ammunition bunker on the western side of the 2d Combat Reconnaissance Platoon area where an ample supply of explosives was stored, but as they passed the 4.2-inch mortar pit, an enemy artillery round landed in a fuel dump next to the ammunition bunker. The dump exploded with a roaring flame, belching thick, boiling, black smoke skyward. The path to the ammunition now blocked, Moreland and Fragos turned back toward the center, picking up two LAW's on the way. The time was now approximately 0430. The crew of the second tank, perhaps encouraged by the display of invulnerability exhibited by the lead tank, had meanwhile edged their tank closer to the rear limits of the Company 104 area; now it stopped less than 100 meters from the operations center. With North Vietnamese infantrymen crouched behind it, and its turret rotating slowly from side to side, the tank fired its machine gun in short staccato bursts, sweeping the camp. Through a black billow of smoke that rolled across the camp, Sergeant Tirach, still at the first 4.2-inch mortar pit, spotted the tank, and, realizing that from his position he had a clear shot, steadied himself in a semi-kneeling posture at the edge of the pit parapet, aimed a LAW, and squeezed the trigger. Another misfire. The Lang Vei defenders' heroic efforts to blunt the tank attack had thus far been futile. Although the tanks had not yet entered the inner perimeter, it was in grave danger. fired, scoring a hit on the front end. Apparently undamaged, the tank halted again, while its turret turned in search of its tormentors. When the tank resumed its run, Wilkins tried again, but this time his weapon misfired. Resupplied with an armful of LAW's that Sergeant Burke rushed to him from the team house, Wilkins followed the tank toward Company 102, firing rockets as he moved and scoring hits that did not stop the tank. Sergeant Thompson fired his M79 grenade launcher at the tank's treads. Sergeant Tirach tossed grenades at its underside. Other men climbed on top of the tank and attempted to force grenades into its hatches. But the tank continued onward, immune to the weapons of the Lang Vei defenders. While Captain Willoughby's force was under heavy siege, the Laotian survivors and their six American advisers at the old camp site were faring much better. Either the enemy was unaware that the old camp, which lay about a kilometer east of the new camp, was occupied or they did not think a diversionary attack against it was worth the effort. Except for a U.S. Air Force 250-pound bomb and a few mortar rounds, the old camp had received no heavy fire. Frustrated, anxious to help their beleaguered comrades, the Americans there monitored the battle by radio, attempting to determine the course of the fighting. By 0130 Sgt. Richard H. Allen, an assistant medical specialist, had persuaded the Laotian battalion commander to fire 81-mm. illumination rounds over the fighting. A few moments later, Spec. 4 Joel Johnson, another assistant medical specialist, saw the two enemy tanks and infantrymen blasting away at Company 101 from the north. Determined not to see the camp fall, Specialist Johnson asked Sfc. 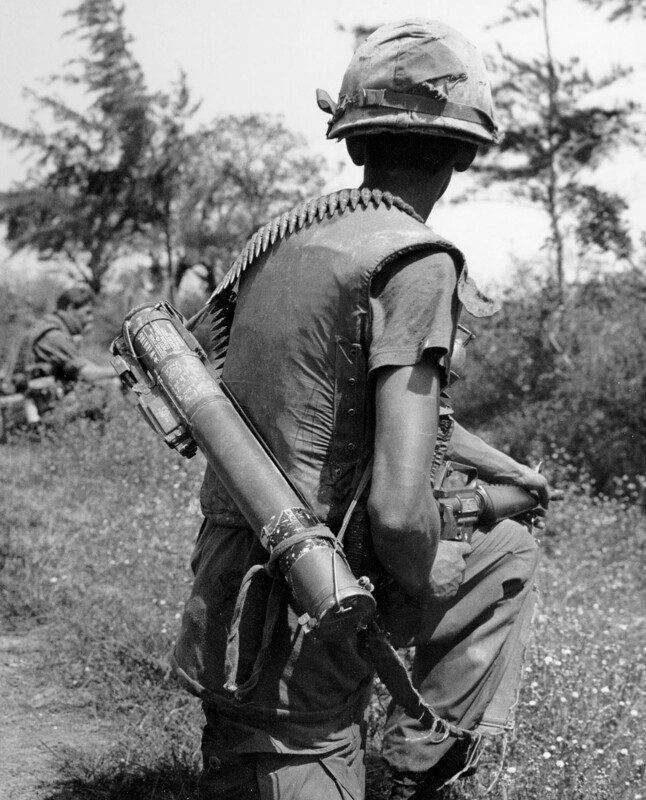 Eugene Ashley, an intelligence noncommissioned officer and their leader, for fifty Laotian soldiers and a 3.5-inch rocket launcher. He wanted to attack the tanks from behind. Ashley, agreeing with the plan, took him to the Laotian battalion commander, who decided against sending troops before daylight. It was about 0245 when one of the tanks in the Lang Vei Camp that had figured in the attack against Company 103 rolled toward the operations center. Enemy armor had finally broken through the inner perimeter. An Engineer officer from Da Nang headquarters, 1st Lt. Thomas E. Todd, saw the tank as it passed his vantage point, the emergency medical bunker. He had been at the camp since the afternoon of the 5th, his mission to supervise the repair of shell-damaged defenses. In an effort to join in the fighting, he had been searching for hand grenades. point-blank at the front entrance of the medical bunker. Shell fragments whined through the air. Another tank approached, followed by about fifty enemy soldiers. It too stopped, fired at the rear entrance, and then lumbered on. Luckily, Todd suffered only a minor wound. Since it appeared to him that the enemy had control of the entire camp, he decided to remain hidden in the bunker until daylight. Another enemy tank from Company 104's area had meanwhile penetrated the inner perimeter wire near the Number 2 81-mm. mortar, a stone's throw from the operations center. Destroying the mortar position, the tank headed straight for the operations center, followed by North Vietnamese infantrymen. Willoughby's command bunker was now threatened from two directions. For all the one-sidedness of the battle Lang Vei's defenders still had plenty of fight in them. When the tanks approached the operations center, the men of the tank-killer teams had been searching for more LAW's. Colonel Schungel, Lieutenant Wilkins, Lieutenant Quy, and Specialist McMurray were outside the east entrance to the command bunker, crouched behind a double row of 55-gallon drums filled with rocks and earth. Sgt. (E-5) David M. Brooks, Lieutenant Longgear, and Sergeant Fragos had gone down inside the bunker to hunt for more LAW's, but the others poured a withering fusillade of small arms fire on the enemy infantrymen to keep them from moving in on the operations center. Someone fired a rocket point-blank at the tank approaching from the direction of Company 104 but merely immobilized it. With a jolting roar the tank fired at the command bunker at a range of less than fifteen meters. The blast blinded McMurray and mangled both his hands. It hit some of the rock-filled drums, half burying Wilkins beneath them. Colonel Schungel, knocked flat by the explosion, was stunned and suffered a fragmentation wound in his hip. On the heels of the blast, the North Vietnamese troops rushed at the small band, firing their AK47 assault rifles. But Lieutenant Quy, who was not injured, fired his M16 rifle as fast as he could reload and undoubtedly saved his companions, for once again the enemy infantrymen faltered, their ranks depleted by the deadly fire. Quy suggested that they find a hiding place away from the command bunker, the two American officers agreed. Quy ran for the team house, but as Wilkins and Schungel started to follow, the second tank that had passed Lieutenant Todd approached from the west. Schungel and Wilkins hurried back to cover just as the tank fired at the observation tower on the command bunker. The explosion caught Specialist Moreland on the ladder as he was attempting to enter the tower and wounded him. Sfc. Hugh E. Earley, who was already in the tower, suffered wounds in the head and shoulders from shell fragments. While both injured men climbed down from the tower and into the bunker, Schungel rushed forward and tossed two hand grenades under the tank. Almost simultaneously a rocket from a LAW struck the tank in the rear. The tank commander's cupola hatch flipped open with a metallic clang, but only flames emerged. Possibly affected by the sight, the crew of the other tank attempted to leave their stalled vehicle, although it was still operable. As each crewman crawled out, Colonel Schungel killed him with an M16. By this time North Vietnamese soldiers in small groups were all over the camp. Lieutenant Wilkins yelled down into the bunker that he and Schungel were coming down. Schungel, however, persuaded him that they would have a better chance if they were not pinned down, and the two men sought refuge in the team house. Although the enemy appeared to be all but in possession of the camp, Lang Vei's defenders had not given up. The tank attack had demolished both entrances to the deeply dug command bunker. Inside were Captain Willoughby, Lieutenant Longgrear, Sergeant Brooks, S. Sgt. Emanuel E. Phillips, Sergeant Earley, Sergeant Fragos, Specialist Moreland, and Specialist Dooms, most of them wounded. With them inside were the Vietnamese camp commander (Willoughby's counterpart), the Vietnamese sergeant major, the Company 104 commander, an interpreter, a CIDG communications man, and twenty-five other Civilian Irregular Defense Group soldiers. A few seconds after Lieutenant Longgrear had descended into the operations center with Fragos and Brooks in search of LAW's, he had heard the tank blast away at the bunker entrance above him. Longgrear, knowing where he had last seen Colonel Schungel, assumed that the colonel could not have escaped the blast and yelled to Willoughby that Schungel was dead. In the confusion of the moment, Willoughby, without questioning, accepted his death as fact. He also assumed that the only survivors left in the camp were those inside the operations center with him. Above the bunker, Schungel and Wilkins had no sooner left for the team house than the North Vietnamese converged on the operations center. A tank rumbled onto the top of the bunker in an attempt to crush it, but the six-foot crust of dirt, steel, and reinforced concrete held. Enemy infantrymen then began to toss grenades and satchel charges and to fire their weapons down the damaged stairwells. The wounded McMurray, whom Schungel had dragged to safety and left behind the sandbags at the entrance, yelled down the stairwell for help. Attempts to rush up the steps and rescue him were met by a burst from automatic weapons. Willoughby extinguished all lights in the bunker. Although lack of message traffic on his radio reinforced his belief that no other team members remained in the camp above him, he was determined to hold the operations center to the end. He cautioned everyone to keep his weapon at the ready and told those who were not wounded to keep a sharp eye on the entrances, from which he expected a determined final enemy assault. But for the time being the North Vietnamese seemed content merely to harass the men below. Above ground American and Vietnamese defenders who had escaped death or capture were trying to evade the enemy and escape. Sergeant Tirach had remained at the 4.2-inch mortar pit as long as he could. Then, with Sergeant Brooks, he had climbed to the roof of the team house, armed the .50-caliber machine gun there with armor-piercing ammunition, and was firing away at the tank attacking the bunker entrance. When the tank began sweeping Tirach's position with machine gun fire, Brooks headed for the bunker while Tirach ran for the western side of the team house. At the team house Tirach found Sfc. Michael W. Craig, Willoughby's team sergeant, Sergeant Thompson, Sergeant Burke, and about fifty CIDG and mobile strike force soldiers. After a hurried conference they decided to leave the camp through the northern perimeter- the only place where there was no visible sign of the enemy. then moved 200 meters north and finally settled in a dry creek bed which offered some cover and concealment. Around them they could hear Vietnamese voices and a continuing exchange of small arms and automatic weapons fire, while off in the distance the steady drone of tank engines and the rattling of machine gun fire, punctuated by the sharp crack and whine of artillery, told them that the fight was still raging in the camp. When Colonel Schungel and Lieutenant Wilkins had reached the team house, Schungel directed Wilkins, who was weaponless, to hide behind the bar. The colonel then armed himself with an Ml6, two magazines, and two fragmentation grenades and took a position in the center of the building where he could observe both entrances. He had cut the inner-tube hinges from both doors so that they would remain open. He did not have long to wait. At 0330, five North Vietnamese infantrymen, three with AK47's and two with satchel charges, approached the northern entrance. Unsuspecting, they came toward the building in a group, chattering excitedly. Schungel signaled Wilkins to remain quiet. When the North Vietnamese were less than five meters away the colonel mowed them all down with the bullets from one magazine. Almost immediately, a burst of small arms fire raked the room, followed by the explosion of a satchel charge which rattled the building, wounding Colonel Schungel in the right calf. Realizing the vulnerability of the team house, Schungel decided that he and Wilkins should take cover under the dispensary. Moving quietly, they made their way to the medical building, which lay less than a hundred meters away to the west. As they crouched in the darkness under the northern end of the shack, they could hear what sounded like at least an enemy platoon inside, smashing bottles and destroying medical supplies. Between the bursts of gunfire and exploding bombs, they could also hear snatches of conversation between a runner from a battalion headquarters and an enemy company commander. Schungel and Wilkins felt safe for the moment and settled down to wait. What was being done by higher headquarters, in the meantime, to reinforce the camp while there was still time? again. When Company C headquarters learned that the request had been denied, it too tried and was turned down. The marines declined to send a relief force because they felt that any attempt to reinforce via the highway would be ambushed. A heliborne assault, they believed, was out of the question because it was dark and the enemy had armor. While the issue was debated back and forth until it reached Headquarters, III Marine Amphibious Force, and then Military Assistance Command, Vietnam, Company C headquarters placed a mobile strike force company at Da Nang on standby alert, as well as a second company-size unit from another A detachment in the I Corps tactical zone. As soon as helicopters were available, they were to be committed. The siege of the tactical operations center meanwhile continued and by 0320 Willoughby was unable to communicate with Da Nang directly because enemy fire had destroyed most of the radio antennas. He nevertheless continued to receive Khe Sanh loud and clear. Relaying instructions through the marines, Willoughby continued to call for air strikes and artillery. The enemy persistently harassed the force trapped in the bunker with grenades, explosives, and bursts of fire down the stairwells. By 0430 the North Vietnamese had begun to dig a hole parallel to the wall of the operations center bunker. As the minutes ticked by Willoughby and his men could hear the muted sounds of intrenching tools clawing at the earth, and the animated chatter of the Vietnamese; from time to time someone tossed a grenade down one of the stairwells where it went off harmlessly. Shortly after 0600 a thermite grenade rolled into the darkened command bunker and exploded in a bright orange flash before anyone could grab it. Maps and papers that were scattered about the bunker caught fire. The enemy followed this success with a flurry of fragmentation grenades and for the first time used tear gas grenades. Though the fires burned out in twenty minutes because of poor ventilation, the smoke and gas created momentary panic. To breathe easier, the defenders hugged the floor where the air was fresher and took turns with the few gas masks they had. All became sick and many vomited. Assuming that the end was near, Phillips and Dooms began throwing classified documents into the fire. A voice called down the stairwell in Vietnamese. "We are going to blow up the bunker, so give up now." led them up the stairs and out of the bunker. They had evidently decided to surrender. For perhaps five minutes nothing happened. Willoughby had been depending on the firepower of the fifteen or so Vietnamese. There were eight Americans left, six of them wounded, including himself. Still he was determined to hold out. Squinting his eyes from the smarting effect of the gas, Sergeant Fragos edged as close as he dared to the door through which the Vietnamese had just passed. Cautiously, he leaned out and peered upward. In the flare light above he could see six CIDG soldiers lined around the exit with one of the detachment's interpreters. The interpreter yelled excitedly to Fragos in English to surrender. Before Fragos could reply, a North Vietnamese soldier wearing a steel helmet with camouflaged cover and armed with an AK50 folding stock automatic weapon, tossed a grenade at him. Fragos screamed a warning as he dived to the floor. Other than Fragos, who was nicked in the left elbow by a small grenade fragment, no one was injured. The sergeant piled pieces of rubble and flak vests on top of himself as a shower of grenades bounced down the stairs. All exploded harmlessly. After the explosions all was quiet except for the digging sounds, which were coming steadily closer to the wall, and the talk between the CIDG troops and their captors above. Fragos moved back to the door, this time with Longgrear and Moreland. Up above they saw a North Vietnamese summarily shoot a CIDG soldier who had been stripped to his shorts. The three men eased back into the bunker as a voice called out in English from upstairs. "We want to speak to your captain. Is he still there?" "Have you got a weapon?" "I've got plenty for you!" All three fired their Ml6's up the stairwell. In response the enemy tossed down another barrage of grenades. The talking between the captors and the South Vietnamese above the bunker stopped. And then, amidst screams and yells, the enemy soldiers began firing their weapons. Although no bodies were found later at the spot, the Americans assumed that the prisoners were executed. the bunker he could hear Vietnamese voices. Suddenly, with an ear-splitting roar, the wall disappeared in a boiling cloud of dust and smoke, and chunks of concrete flew about the bunker. When the smoke and dust cleared, there was a gaping hole in the wall, six feet wide and four feet high. Now the North Vietnamese soldiers had direct access to the bunker. The blast had knocked Fragos unconscious and seriously wounded Moreland in the head. Dragging both men well back from the hole, Willoughby and the others steeled themselves for the final enemy assault. Yet the North Vietnamese did not seize the advantage and seemed satisfied instead to continue tossing random hand grenades into the operations center. Although Willoughby had no way of knowing it, efforts to relieve him were close at hand. At the old Lang Vei Camp, Sergeant Ashley, Sergeant Allen, and Specialist Johnson had continued to try to get some help for their beleaguered comrades. Turned down by the Laotian battalion commander when they had asked him for men earlier, the three Americans held him to his promise to give them troops at dawn. While they waited for first light, they directed air strikes and flare drops. As the sky turned gray, the three Americans went again to the Laotian battalion commander. After an hour's haggling, they were able to muster perhaps 100 armed Laotians. Ashley assembled them and, through an interpreter, explained that they were going to the camp, rescue survivors, and retake the camp if possible. While Johnson radioed Dooms in the tactical operations center that they would be on the way shortly, Ashley and Allen formed the force into a skirmish line for the move. Next, Ashley radioed the forward air controller overhead for strafing runs on the camp to soften it up. The three Americans watched as the stubby aircraft swooped down low over the camp through enemy machine gun fire, its weapons blazing. With the rescue force extended on line for approximately a hundred meters, Ashley, who was in the middle of the formation, with his PRC-25 radio strapped to his back, gave the signal to advance. To help control the maneuver, Allen was on the right flank, Johnson on the left flank. force troops still in fighting condition and with little prompting the stragglers joined the force. Approaching the eastern end of the Company 101 position, Specialist Johnson looked to his left front just in time to see two Vietnamese waving to the Laotian troops from bunkers in the Company 104 sector, less than a hundred meters away. Johnson, not wanting to take chances, yelled to them to come out of the bunkers with their hands in the air. The two soldiers ignored him and continued to wave and shout. Sensing a trap, Johnson shouted for everyone to get down, and none too soon. Almost immediately the enemy opened up with at least two machine guns and other automatic weapons. In response to yells from the three Americans to advance, some of the Laotians inched forward reluctantly while others pulled back. Minutes passed. A shell from an 82-mm. mortar round landed so close to Johnson that the blast blew him twenty meters, though miraculously he was not wounded. After two determined efforts to organize a frontal charge proved futile, Ashley gave the order to pull back north beyond the Company 101 position to Highway 9. He would soften the target with air strikes. Ashley radioed Willoughby that he had met stiff resistance but would try again. Inside the operations center, the Americans waited. Before Ashley's attempt, they could hear heavy enemy machine gun fire from just above them on each air strike pass. The enemy would not give up his prize easily. Meanwhile, Fragos busied himself with tending the wounded as best he could. His biggest worry was Specialist Moreland, who was delirious from a dangerous head wound. Willoughby worked at his radio, trying to re-establish communication with Khe Sanh which he had just lost a few minutes before. A grenade sailed through the hole in the wall, knocking him unconscious. Now leaderless, the Americans decided to play dead in the hope that the enemy would go away. Fragos, administering morphine to Moreland to calm him, was overcome by nausea from the gas fumes, acrid smoke, and lack of water, and started to vomit. Specialist Dooms stopped his work on the radio to quiet him as the waiting game with the enemy continued. The men spoke only when necessary and then in brief whispers. air strikes that Sergeant Ashley had called in to blast the camp. By about 0930 when the strikes were over, they cautiously hobbled out from under the dispensary and headed east. Just west of the building were the hulks of two burned out tanks, apparently destroyed by aircraft. Seeing an air controller circling above, Schungel waved frantically. The pilot waggled his wings in acknowledgment. At this point, Schungel was convinced that he and Wilkins were the only ones left alive in the camp. As they passed through the 1st Combat Reconnaissance Platoon positions, there was no sign of life. Finding an abandoned Upton truck, Schungel tried in vain to start it. While he and Wilkins were tinkering with the engine a Vietnamese yelled to them from a nearby bunker to join him. Glad to know that there were still some friendly troops alive, the two exhausted Americans limped toward the bunker. As Wilkins entered, Schungel, who was just behind him, fell with a bullet in his right thigh. He had been wounded for the third time. Unlike Colonel Schungel and Lieutenant Wilkins, Sergeant Tirach and the others in his group had ventured from their hiding places just north of the camp shortly after dawn and were cautiously edging their way eastward toward Khe Sanh. Observing Ashley's first abortive assault on the camp and assuming that it was a friendly action, they came out in the open, waving and shouting to attract attention. When they were not fired upon, they moved closer. Sergeant Tirach got the scare of his life when he was near enough to see that many of the men in the attacking force carried AK47 assault rifles, the standard weapon of the North Vietnamese. He did not know that the Laotians often used enemy weapons. Stepping out on the road to get a better look, Sergeant Tirach was relieved to see Ashley at the radio, with Johnson and Allen nearby. When Ashley explained what they were trying to do, Tirach and his men, for all their fatigue, readily agreed to help. During the second assault the enemy used 81-mm. and 60-mm. mortars against the American-led force. As the Americans approached closer the North Vietnamese, yelling and screaming, began tossing grenades and firing automatic weapons. On one flank the force came to within twenty-five meters of the enemy-held bunkers before some of the Laotians again began to fall back. While Ashley called in air strikes, Tirach caught sight of Colonel Schungel limping toward the group along Highway 9 with the aid of two CIDG soldiers; three others were helping Lieutenant Wilkins. Running to the wounded colonel, Tirach and Allen carried him to the attacking group's assembly area, a spot perhaps 500 meters west of the old camp, just off the highway. center bunker that he would try again. The rescue force had dwindled to half its original size. Allen and Ashley had to force Craig, who had been shot in the hip, to remain behind. For the third time, the men advanced frontally against the enemy bunker line. Johnson and Tirach remained behind to man a 60-mm. mortar with which they lobbed high-explosive shells and one white phosphorus round into the enemy positions just ahead. The seventh round misfired. Cursing their luck, Johnson and Tirach snatched up their own weapons and joined the assault. The attackers made good progress until the enemy let go with a fusillade of small arms fire from the bunkers. Puffs of smoke rose from exploding hand grenades. Again the attack failed. Determined to try once more, Ashley radioed the forward air controller to plaster the area again and to continue the strikes, shifting them westward, just ahead of his assault line as it advanced. He yelled to Johnson to return to the old camp for a 57-mm. recoilless rifle. With it he could perhaps knock out the bunkers. As the aircraft darted down on their bombing and strafing runs, Allen watched them from where he lay sprawled in the dust, catching his breath. He felt certain that this time the attackers could reach the operations center. He had counted only nine enemy soldiers during the last assault and had even seen a few of those hit. With the added firepower of the recoilless rifle, one determined charge would do the job. As Ashley and his men assaulted for the fourth time, Johnson sighted and aimed the recoilless rifle for the Vietnamese gunner. Too anxious, the gunner jerked the trigger and the round went high, missing the entire camp. Impatiently, Johnson pulled the nervous gunner aside, and with another CIDG soldier loading for him put three high-explosive rounds in the front aperture of each of the two bunkers that had been giving the attackers the most trouble. Turning the weapon over to the gunner, he raced forward to join the assault. The added firepower obviously helped, for the attackers passed through the bunker line. They had reached the easternmost 81-mm. mortar pit and quickened their pace for a dash to the operations bunker when Ashley fell. A bullet had passed through his chest on the right side and gone through the radio on his back. The North Vietnamese soldiers had plenty of fight left in them and cut loose with everything they had. The attack again collapsed. This last blow came at 1110 and marked the end of attempts to reach the trapped force in the operations bunker. At Da Nang, in the meantime, the matter of how to reinforce the camp was still under discussion. When the commander of the Military Assistance Command, Vietnam, General William C. Westmoreland, who happened to be in Da Nang at the time for a conference, learned of the fight and the marines' decision not to risk a relief force, he directed the marines to supply enough helicopters for a fifty-man mobile strike force under Special Forces control. He also directed Col. Jonathan F. Ladd, commanding officer of the Special Forces Group, and Maj. Gen. Norman J. Anderson, commanding officer of the 1st Marine Air Wing, to develop a rescue plan. The survivors were to be brought out, for, although no official report had been received, the Lang Vei Special Forces Camp had apparently fallen to the enemy. In the command bunker at the Lang Vei Camp, Captain Willoughby had regained consciousness during Ashley's final assault. When the attack failed, he called the survivors together. Occasional grenades were still being tossed into the bunker, and the men could hear enemy weapons firing above them. It was getting late and they had been without food or water for almost eighteen hours. Convinced that no help was on the way, Willoughby told the men that he would radio for all available air strikes and that afterward they would make a break for it. Because Moreland was mortally wounded and the others in their injured and exhausted condition would have had difficulty carrying him, the decision was made by all to leave Moreland in the bunker. Willoughby planned to return for him later. When Willoughby radioed for air strikes, the air controller replied by directing salvo after salvo on the positions. Shock waves beat against the faces of the survivors as heavy percussion shook the ground underneath them. At 1600 the men were ready. With Lieutenant Longgrear in the lead, one at a time they quietly climbed the stairs and then ran for supply bunker Number 2. Overhead, planes flew dummy passes to keep the enemy covered up. As Fragos, the sixth man out, neared the supply bunker, automatic weapons fire from the former positions of Company 104 began to beat a deadly path in the dirt just fifty meters ahead of him. Lieutenant Longgrear wheeled and fired an entire magazine from his M16 rifle into the bunker aperture, silencing the weapon. With Sergeant Phillips and Captain Willoughby carrying Sergeant Earley, the men made their way out of the camp unmolested. A few meters east of the perimeter, Lieutenant Quy in a jeep met them and everyone piled in. When the survivors reached the old camp Willoughby found Colonel Schungel, in spite of his wounds, hard at work on the radios, trying to co-ordinate the arrival of the fifty-man evacuation force. Willoughby told him that as far as he knew there were no survivors outside of the operations center. Schungel in turn radioed the forward air controller to plaster the entire camp with bombs, except for the tactical operations center. Although the men did not know it, Lieutenant Todd was still in the Lang Vei Camp. During the afternoon he too had realized it was now or never, and shortly after Willoughby's band had escaped he himself had left the emergency medical bunker. He drew automatic weapons fire that came from behind him as he went first to the operations center, hoping to find some Americans still alive. Instead, he found Moreland inside, apparently dead, half-buried in debris from a direct bomb hit on the operations center. As he left the bunker he looked in the direction of the old camp just in time to see one of the rescue helicopters land there. Elated, the lieutenant, despite his wound, ran to the old camp. When Todd arrived, the rescue operation was well in progress. A flight of Marine Huey gunships and jet aircraft was circling the area to provide cover. The fifty-man reaction force had established a perimeter around the landing zone. By 1730 all known survivors had been evacuated to Khe Sanh. The battle for Lang Vei was over. Of an original fighting force of approximately 500 indigenous troops, Captain Willoughby had lost over 200 killed or missing and 75 wounded. Out of 24 Americans, 10 were killed or missing and 11 wounded. Almost all the camp's weapons; and equipment were completely destroyed. Nearly 6,000 stragglers from the Lang Vei area-Laotian soldiers, mountain tribesmen, South Vietnamese irregulars, and nondescript civilians-followed Willoughby's men to Khe Sanh. When the panicky horde descended on the Marine base, its commander, Col. David Lownds, knowing that enemy agents might well have mingled with the crowd, refused to admit the refugees. Instead, he took away their weapons and held the refugees in an area outside the wire. Eventually representatives of the American Special Forces were called in to screen them and evacuate those whom the Special Forces determined to be friendly. Thus did Lang Vei fall, marking the first successful use of armor by the enemy in the Vietnam War. There were those who believed that the loss of the camp would eventually lead to the destruction of Khe Sanh, but these fears never materialized.